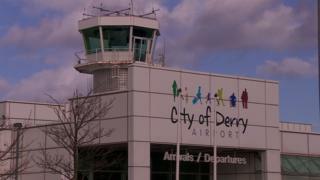 Derry City and Strabane District Council could have used the collapse of Flybmi to plan its exit from City of Derry Airport, an independent councillor has said. Paul Gallagher told a council meeting on Monday the council owned airport is "doomed to fail." Loganair are taking over the Derry to Stansted route after Flybmi's collapse. The public service obligation (PSO) route is subsidised by the UK government. Mr Gallagher told BBC Radio Foyle the airline's collapse presented council with an opportunity to "take stock" and look at an "exit strategy." "This council is paying £3.3m yearly for this airport. It would have been a good opportunity for discussion rather than getting locked into negotiations that hold the ratepayer and council to ransom." He said council had entered post Flybmi collapse negotiations with other airlines in a "very weak position." "If this new carrier runs into crisis we are just kicking the can down the road," he said. The council's chief executive John Kelpie said the regional airport faced a number of financial challenges at present. But he insisted the council remained optimistic about the London route. "The PSO will be in place for two years and possibly another two years beyond that so we're very hopeful that in the short to medium term connectivity, in particular with London, can be retained," he said. "It is a constant battle to ensure the airport remains financially viable," he added. The Derry to London PSO is the first of its kind in Northern Ireland. Flybmi had operated flights between Derry and London Stansted since 2017. Loganair will operate the flight from 27 February for a seven-month period before the remainder of the PSO's duration goes back out to tender.